Do we need to elaborate? Civility is always asking more of us than the easiest response in situations of disagreement or simple divergence on issues and topics of life. This is no different. Civility will allow the other to apologize, and will do so with grace and courtesy. Accepting an apology is tough stuff, but that’s all the more reason to knuckle down and get it done! The tough choices are often the most needful. At the end of the day, it’s a civil response to accept the other’s apology because the day will come soon enough when you need your own accepted! 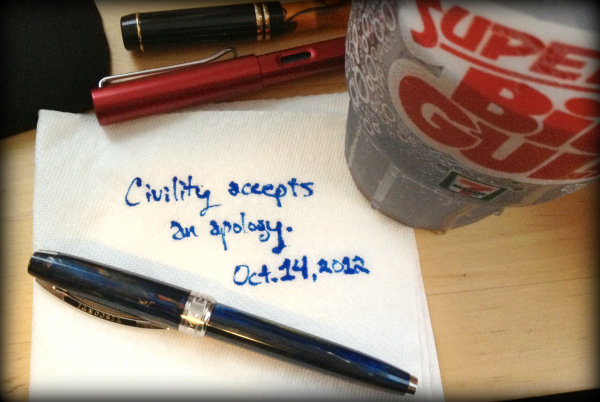 This entry was posted in October 2012 Civility and tagged apologies, apology, Civility, tough choices.